if it’s going to rain. This poem first appeared in Blue Hour Magazine (2013). Marcia J. Pradzinski is a Chicago native who now lives in Skokie,Illinois. Having taught English in the International Teaching Assistants program in Chicago for many years, Marcia has always loved words in their many contexts: in print, in songs, and in foreign languages such as Polish and Ukrainian, which she heard spoken while growing up. Her poems have appeared in print journals and anthologies and online. 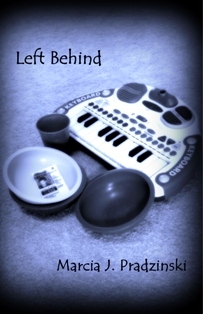 Marcia has a brand new chapbook, Left Behind, just out from Finishing Line Press. Oh-so true. Every word. It really hits the nail on the head! Great poem. Oh, I really like this. That's exactly what happens. But I love it. Not the wasting of time which I sometimes regret, but the connectedness of Facebook, the instantaneous access to information in a Google search, and finding out whether it will be cool enough in Dallas to walk outside at 7:30 in the morning. Thanks, Marcia, for this poem. For sure, Marcia. We've all been there--will be again. Who Me? Couldn't be! Oh yeah, it sure is. Even my brother in OH who doesn't like poetry loves this one!!! Yep! That just happened to me, and I ended up here! Thanks for the smiles. Brilliant! --and all too familiar!